Last month Barney and I participated in the Whole School SEND Summit, spreading our message in a roundtable at the conference about working with parents. More than 200 parents (many attending through the SNJ ticket giveaway), teachers, senior leaders, Multi Academy Trust leaders, SENDCos, governors, local authority leads and third sector organisations came together to share best practice and build a community in SEND provision (video here). The event was organised by the London Leadership Strategy, a non-profit organisation born out of the London Challenge, which itself was established by the 2002 Labour government as a way of improving London schools. LLS is now using its experience to send its 'hit squad' of experienced SEND teachers into schools across the country (where invited) to spruce up their offer for children with special educational needs. Today, looking back on this inspirational event, Anita Kerwin-Nye, Managing Director of LLS, tells us about what they learned from the event that can be taken forward into schools. Anita is also inviting you to help them set their agenda for the coming year. As we all know, our learning doesn't end with our formal education at school, college or university. At our recent Whole School SEND summit I hope everyone, whether parent, teacher or other professional, left with a greater understanding of how working together can only improve the lives of children with special educational needs. However, there were some specific lessons that I took from the event that I'd like to share with you. I'd also like your feedback to some questions at the end, so please do leave your thoughts in the comments or see below for other ways. In his address the Minister for Vulnerable Children and Families, Edward Timpson, pledged a national review of SEND provision (should they win in June) and came out strongly against exclusion of students with SEND. He went on to ask for help from the assembly in identifying areas of need, and called for greater efforts to bring parents to the table to share their insight. Starlight Mckenzie wrote: “Of the issues raised [at the Summit] two stood out to me the most. One was that of differences of opinion between teachers and parents on a child’s potential Special Educational Needs. And the other was about being afraid to admit lack of knowledge when there is an expectation of expertise on ALL SEN (an impossible ask)”. So what next? How can we build a vibrant community in SEND provision and drive meaningful change? The SEND Review Guide is a free tool that has has been downloaded nearly three thousand times and adopted by a number of local authorities. We hope that it will help drive change by establishing a standard framework for the evaluation of SEND provision across the UK. For more info on the guide click here, and for a flyer to present to your school click here. There are also a number of exciting projects in development by Whole School SEND members, including Maximising the Impact of Teaching Assistants (MITA) and SEND Review: Deploying Teaching Assistants, SEND Review: Classroom Practice, and SEND Review: Preparing for Adulthood. For updates on all the latest projects subscribe to the Whole School SEND newsletter here and connect on Twitter using #SENDed and Facebook. But we know there is more to be done and we have been inviting feedback on this and compiling a list of suggested targets. 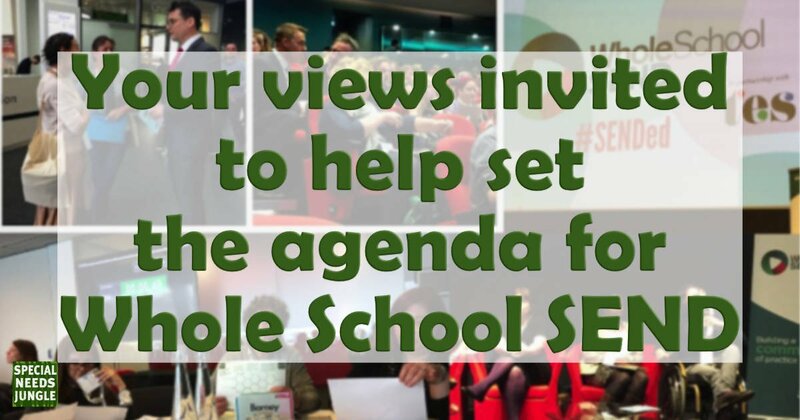 What do you think should be on the Whole School SEND agenda for 2017? What needs to change in SEND provision and how can we do it together? Join the Consortium by taking the Whole School SEND pledge and join the conversation on the Summit Group. We’d love to hear from you. You should read this…and many other posts on that blog, because very many parents experience that teachers often think they know best and take umbrage at a parent telling them their child is struggling in education. They basically usually do not take kindly to parents speaking to them about their child’s school difficulties and in some cases will go to extreme lengths to lie, collude and cover-up. Hi it’s the name of the initiative. If you follow the link through you’ll see there is a website about it. It is aimed at ensuring all staff are concerned with every child and the kids with SEND aren’t just thought of as the senco’s or TA’s responsibility, but of every class teacher.